NOTE: This bracelet is designed for roughly an 8″ sized wrist. If you have a smaller wrist, you may not be able to fit as many components inside the center tube. I should also note that I prefer to use the extremely common Cobra weave when making these bracelets. It is an easy weave and allows you to make bracelets fairly quickly. There are several different types of weaves out there, just do a search on Google or Youtube for examples and decide what is best for you. 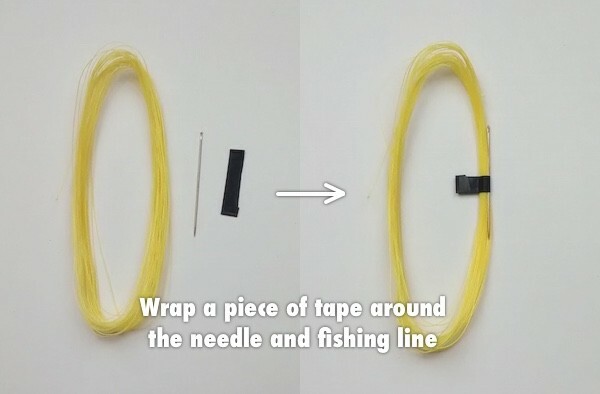 Take the fishing line, needle, and a small piece of electrical tape and tape the needle to the fishing line as shown in the picture below. Fold over a small portion of the ends of the tape so that it makes it easier to take apart. I recommend using the tape because it keeps the fishing line in a nice, organized spool and it keeps the needle in an easy to find place. However, if you’re afraid things might get sticky, you can skip this step. 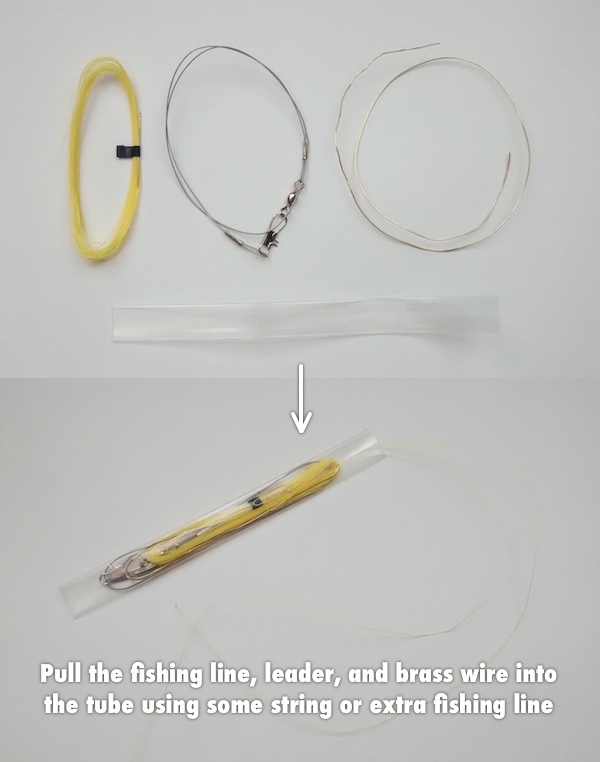 Grab your fishing line, 18″ fishing leader, the 18″ of brass wire, and pull them into the heat shrink tubing using an extra strand of fishing line or some other string. 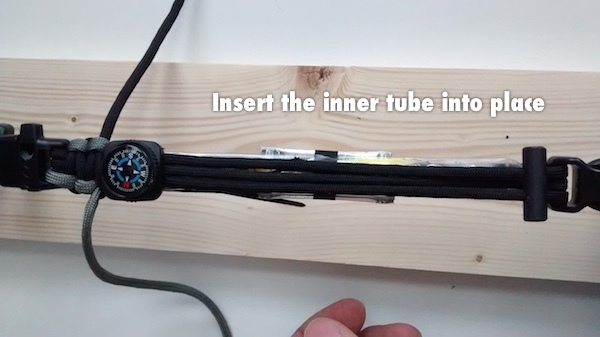 Try to keep the entire bundle as centered as possible in the tube. Using the needle nose pliers, grab the end of the tube leaving about 1/4″ remaining on the end. 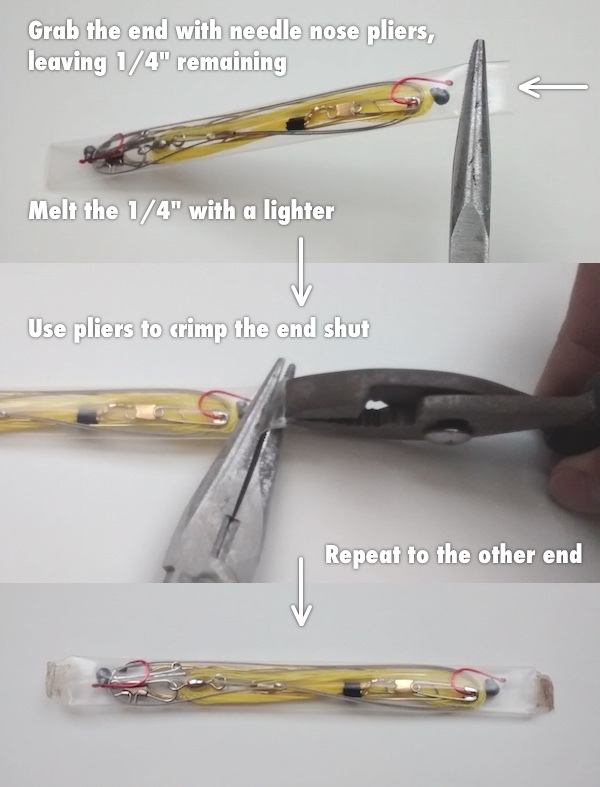 Take your lighter and heat the 1/4″ end until it melts a little. Using a regular pair of pliers, squeeze down on the 1/4″ end while it’s still hot to create a nice seal. Repeat the process on the other end of the tube. 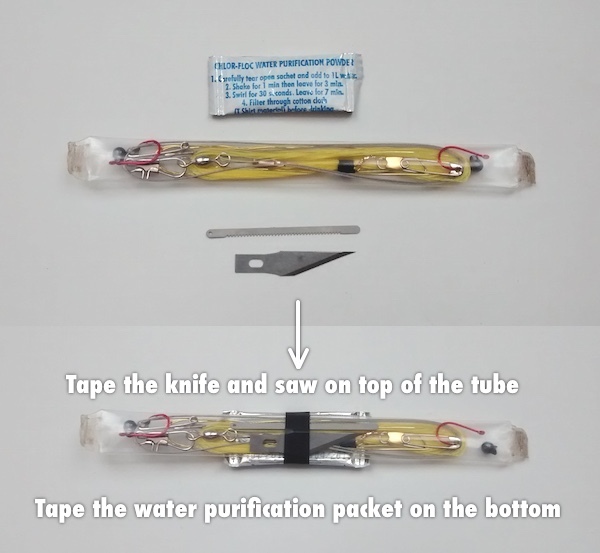 Attach your X-Acto knife blade, micro saw, and water purification packet to the center of the tube with a small piece of tape as shown. The knife and saw should be on top of the tube and the water purification packet should be on the bottom. NOTE: Skip step 6 and 7 if you are making a single color bracelet. 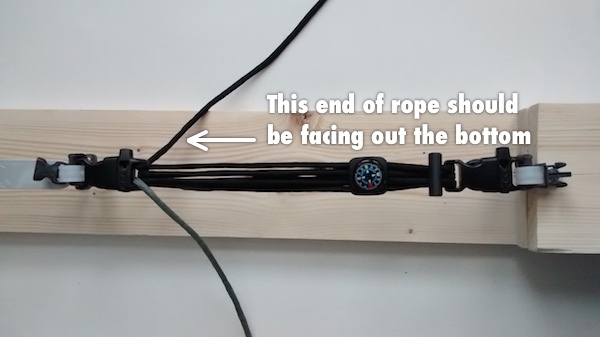 Grab one of the paracord ropes and pull the center strands out an inch or two while holding the outer shell in place. 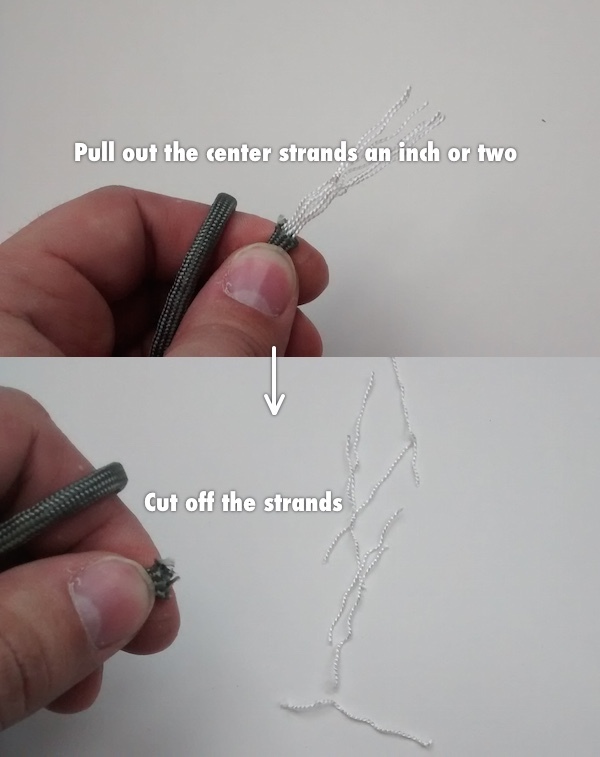 Now, cut off the strands that are sticking out. When you release the outer shell, the idea is to have it go back in place and create a hollow area inside. 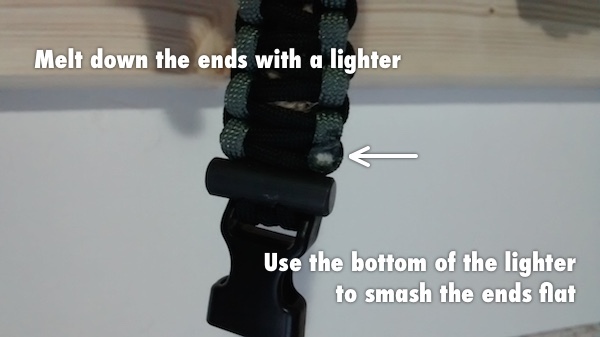 Insert your second colored paracord rope into the hollow area you created in the first one. 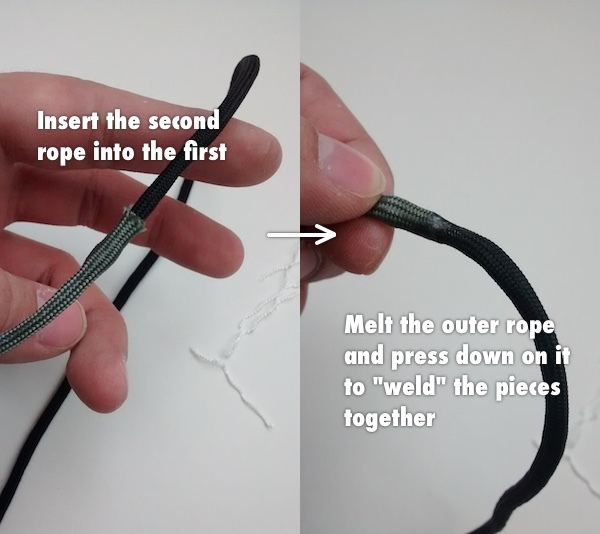 Use your lighter to melt the outer rope a little, then rub your fingers on it while pushing down to “weld” the two ropes together. Once you’re done, give it a little tug to make sure they’re connected – but don’t pull too hard or you may break the bond. 1. The color on the left side of the picture will be the “stitches” on the outside of our bracelet; the color on the right will be the center color of the bracelet. 2. Loop the color on the left from the bottom of the buckle upwards, so that it hangs over the buckle like in the picture. 3. Loop the color on the right starting from the bottom and going upwards on the right side of the buckle, but when looping it on the left side, start from the top and loop it down underneath. Essentially, you want to create elongated oval shapes instead of crisscrossing the rope like a shoelace. Loop 1: This loop should go through one of the FireSteel holes. Loop 2: This loop should go under the FireSteel. Loop 3: This loop should go through the other FireSteel hole. These loops make up the “core” of the bracelet. 5. 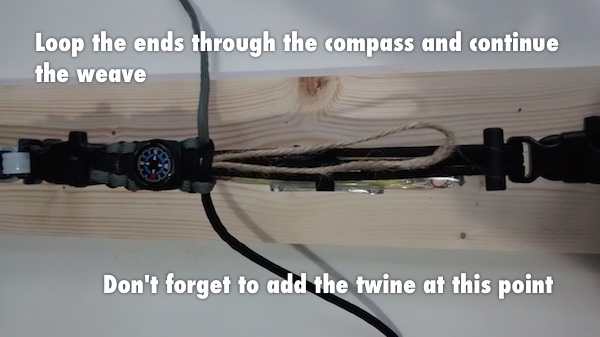 Don’t forget to loop on the compass like I did. Begin weaving. I use the Cobra weave. 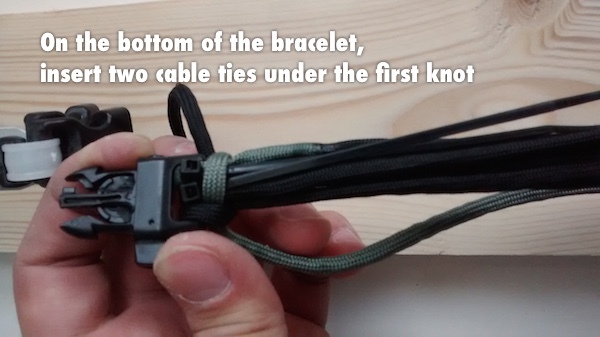 After your first knot, turn the bracelet over and insert two (2) cable ties underneath the first knot. 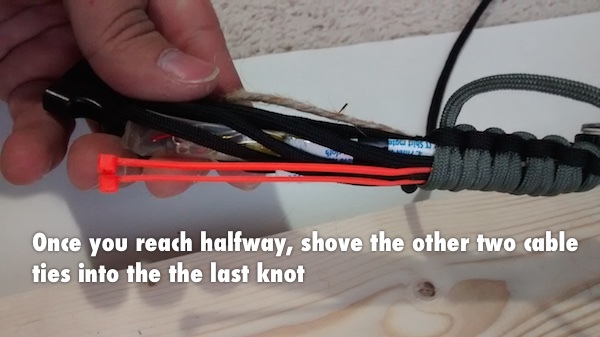 Ensure the rest of the knots cover up the cable ties. 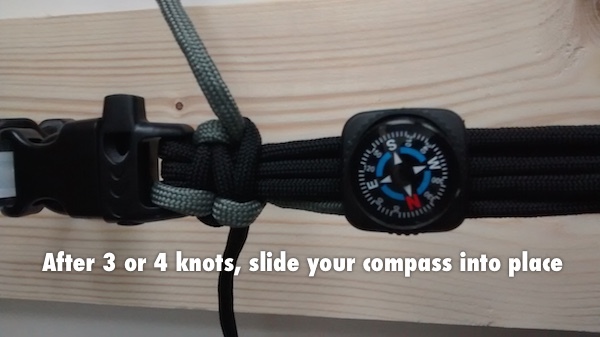 After three (3) or four (4) knots, slide your compass into place. Insert the inner tube into place between the upper and lower strands of the center core. Loop the ends through the compass and continue the weave. Be sure not to forget to add the twine at this point. Once you’ve completed half of the weave, insert the other two (2) cable ties into the last knot. They should stick out just far enough to reach the buckle. 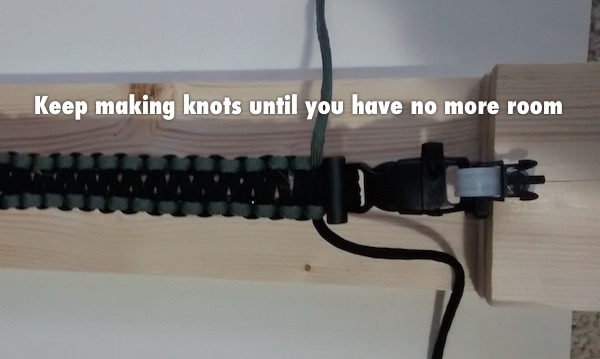 Keeping making knots until you run out of room. 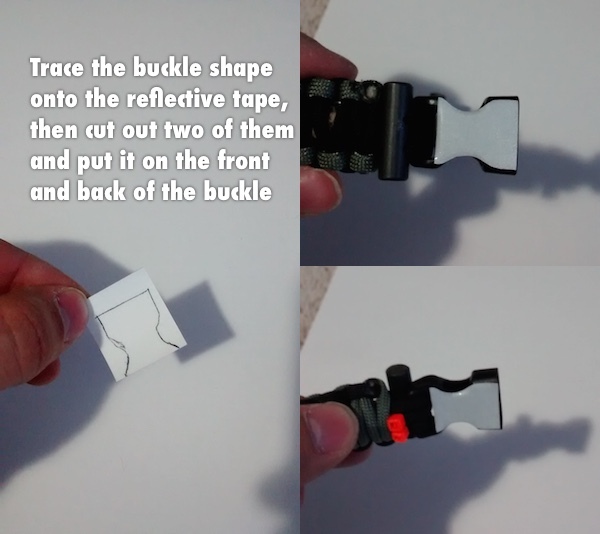 Trace the buckle shape onto two pieces of reflective tape. Cut out the shapes and put one on each side of the female end of the buckle. 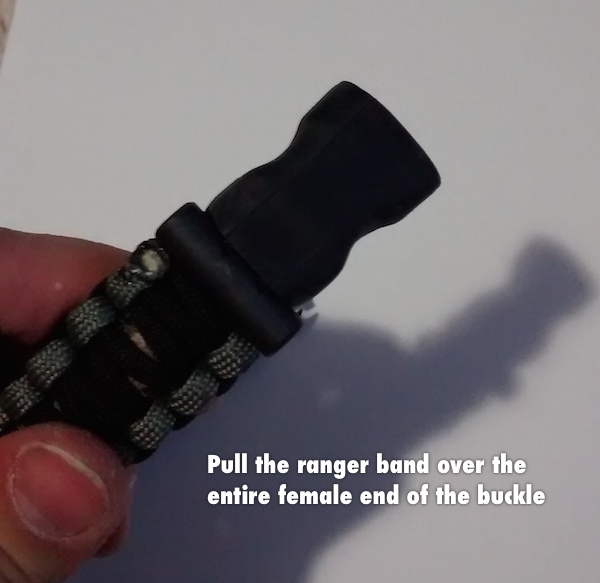 Pull the ranger band over the entire female end of the buckle. Trim as needed so that it fits snug on the buckle, but doesn’t have excess beyond the buckle opening. 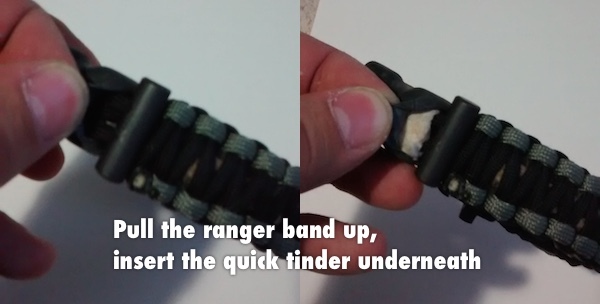 Pull the ranger band up, insert the quick tinder underneath. It should fit nicely into the area the paracord wraps around the buckle. You’re done. Bask in your glorious results! Thanks. I’d have to charge $40 to $50 for each one and have quite a few people interested before I’d consider doing that. They aren’t that cheap to make (because of the handcuff key and mini saw) and take a good amount of time to put together. Nice! A suggestion? Magnetize the needle. For use as a makeshift compass. Float the needle on a small piece of something “floatable” and you have a working compass. Note: before wrapping up, test which end is “north” and Mark that end with red paint (or luminous or any color that stands out). And yes, I know you are including a compass. If you do start making these to sell, please update me to let me know. If you do make these I would be interested in buying several. For self but also for my nieces and family!!! great gift for loved ones. Luke…sell them on Etsy.com they will sell like hotcakes especially around the holidays. I would buy one or two for sure! Where did you find the small compass ? The compass is available on Amazon. It’s linked at the top in the giant list of items, #22. Thanks for the response. I will start gathering components this week to make a bracelet. Thanks again ! How much did I cost to make one? To only make one? If made with all 22 items, probably around $35 or more. If you buy in bulk and get enough material to make 100 or more, it reduces the price to make each one to around $27 each. If you don’t add the handcuff key and micro saw, it’s only about $8.50 to make each one (in bulk). Nope, I’m not. It would take A LOT of interest for me to consider even trying. Really want to sell them? Think Kickstarter! Hi, i’m from europe and i love camping. Can i buy this bracelet? I’ll buy one for $50. Maybe more. Where do you get the mini light sticks ? Thank you ! What size swivel did you use? I’d take two or three at least. Just wondering if your selling these bracelets yet ? 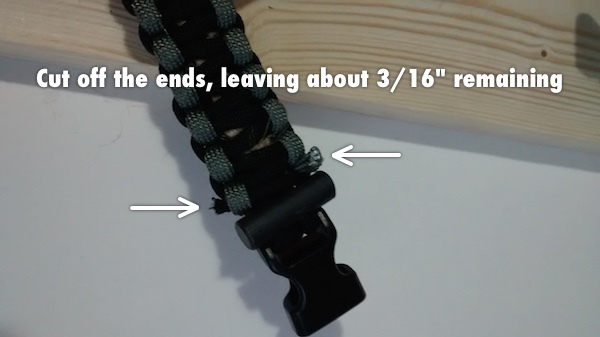 You could also add a watch , by covering the watch pins with a piece of paracord and then use some 4″ zip ties pushed up through the band to secure it. 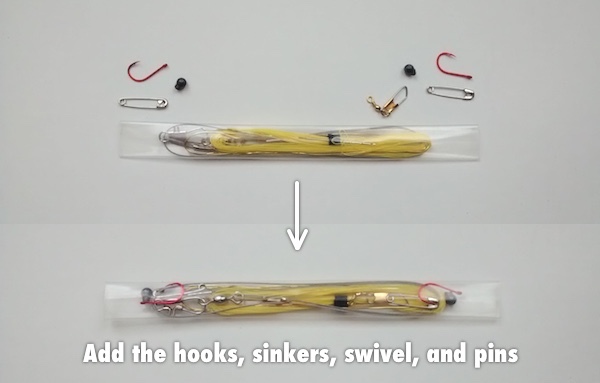 Then add a P38 with the hook to the inside by the same method. I would love one two for my son. Are they for sale? Not yet… but maybe soon. I would buy 1 or 2 for $50. Just let me know. That is an AWESOME bracelet and looks good too. Thanks for all the time and detail you put into sharing your ideas. I’m in Europe too and in the waiting line for shop your product also. Congrat’s this is amazing work!!! Please consider selling on etsy and let us know. I would purchase at least two. I appreciate you sharing the knowledge. Hey those are nice I started selling survival equipment 5 yrs ago I would definitely buy these. Are you selling these yet? I would love to buy one or two! Please get back to me! This is the neatest thing I’ve ever seen. Was wanting to buy one for several of my children and my son n law. Let me know if you decide to sale! 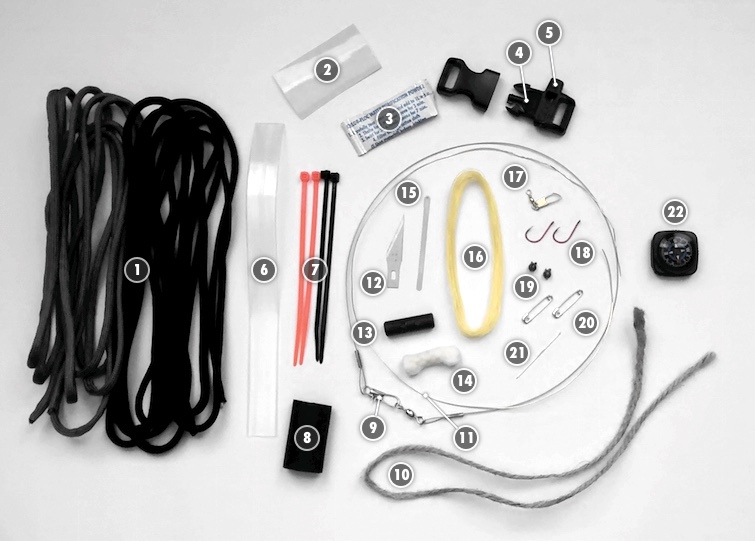 Great project, thanks for sharing what is the purpose for adding the handcuff key ? Great job,do you have a video preapering this project? I thought the purpose of this was to show what was used and how to put it all together…..YOURSELF. I have made two so far. Thank you for sharing. It is, but, if you read all the previous comments from over the last year you’ll see people don’t have time and would rather buy it. He even said at the beginning they weren’t for sale but so many people inquired that he sell them that he has a large demand for ones already made to sell. Thats how a good business starts. Good for the people who are handy and can make the bracelet themselves but also good that he sells them and people who don’t want to make them or can’t make them can buy them. Win win. One thing though when I go to use this will it deploy quickly, or will I have to sit and untie it? I like the idea of all the little extras never know sometimes when they will come in handy. You’d have to untie it if you ever wanted to use it for anything. That video is pretty cool. If someone ever needed an emergency tourniquet, I could see that being very useful. Previous: What is a Ranger Band?